Thanks to my father, George F. Sanborn Jr. of P.E.I. Canada, for this photo. The photo was originally taken in 1975 on his trip to Ireland. I have scanned the printed photograph, hence its somewhat blurred appearance. It would have been an awesome shot given the camera technology of today. Thanks Dad! 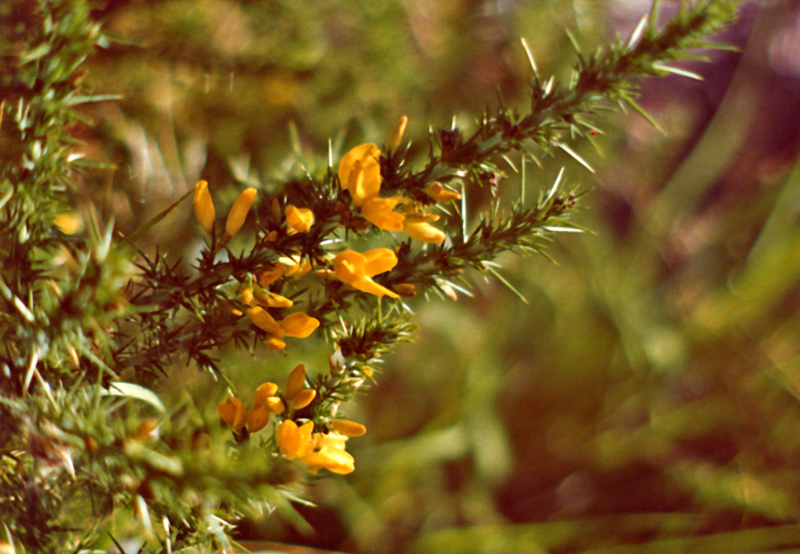 Ulex europaeus, or common gorse, is found in many parts of the world. It is native to much of western and central Europe. The Plants for a Future database (the first link) also mentions the preferred habitat of gorse as being moors, commons and heaths with dry soils. Moors, also known as moorlands, are habitats in upland areas with low dense vegetation and often acidic soils. Heath habitat tends to be considered as restricted to lowlands, but being a common unscientific term, there are occasional discrepancies. Gorse is an obvious member of the Fabaceae with its bilabiate, or two lipped, flowers. The species europaeus is the tallest of the gorses, reaching approximately 2 meters and is rather abrasive in texture. The branches bear thorns and tough leaves. “If people jump out at you suddenly, that’s an Ambush,” said Owl. “It’s an Ambush, Pooh, when people jump at you suddenly,” explained Piglet. the picture, and the quote from Debbie have absolutely made my day. All I can say is “Thank You!” for sharing Debbie! I live on the west coast of Ireland and would like to add that the dry soil requirement so often mentioned is a complete myth. Our climate here is very wet all year round and I get gorse seedlings in the garden in pools of mud, so water does not bother this bush at all. The soil does have to be acidic, though. Gorse is a dreadful weed here (NZ) on most soil types and levels of moisture. The picture, the Pooh bit, the comments – all made my day (it’s after 9 pm EDT). So many of us grew up with Pooh and the gorse bush!! I never really knew what it was, but my imagination did pretty well. I pictured it to look very much like the photo. Thanks, this was fun. Sorry but like NZ its a dreadful weed in Southern Australia. We uprooted several plants when we built in 1992 and yet still the seedlings pop up. Prickly little @#$%^&*! I had forgotten about Pooh’s gorse-bush. When I think about gorse and heather, I remember The Secret Garden, when Mary is told to listen to the moors. I’ve always wanted to see the moors, and listen to them. And I had no idea there was a difference between gorse and heather, which is rather unbright of me, considering they’re different words! I saw Gorse at higher altitudes recently in Madeira, and down in the valley there were tropical plants growing! Here in the southern UK it grows in the nearby Ashdown Forest and the flowers can be so bright yellow that you have to shield your eyes. Here in Cornwall, (extreme SW of the UK), the gorse, as in Ireland, is a major native component of our natural coastlines, hedges , moors and dune systems. The gorgeous coconut scent has to be one of my reasons for coming to live down here, especially on hot days. It features a lot in Cornish folklore and culture as the ‘Fuzzy ‘ Bush, which derives from the alternative name of Furze. In the past it was used extensively as fuel especially to fire the cloam ovens which used to be the main means of cooking buried in the walls of old Cornish houses. Sorry some idiot took it to NZ and Oz, wish the people who let rhododendron loose here had not done so for the same reasons. Gosh, thank you all so much for the great quotes, and pictures. I feel like we are just one big loving family. Thanks again for brightening my day once again, if it weren’t for BPoTD, I don’t know what I’d do. Thank you Debbie! I had read this story to my daughter for years and it brought back so many memories! Again, thank you! Aaaaa gorse is a gorse of course of course…. Elizabeth pointed out some less-negative (I hesitate to say ‘positive’ 🙂 attributes of this plant. Another is that it has provided habitat for some Giant Weta (huge cricket-like critters) that are all but extinct elsewhere. Still, it’s a curse in all but a few spots. Ahhh, and doesn’t Eeyore eat gorse bushes?? I am so glad to see these are real bushes! I grew up in South Florida, US and now live in Oklahoma, US. Neither place has gorse bushes and I have always wondered if they were a fantasy made up by AA Milne! Gorse is also a scourge in Argentina’s lake district. I live in the New Forest, England, where there are large tracts of heathland – mixed heather, gorse, bracken & grass. There are wild horses (all owned) allowed to graze here, and now that they have eaten all the winter grass they are resorting to gorse which grows everywhere. I can’t imagine it is very nutritious but needs must until the spring grass starts growing. In the old days gorse was cut by local people for fuel; but now there are controlled burns to stop it taking over the entire heath. Burning doesn’t kill it, there is new growth from the base the following year, but it does stop it getting too enormous. The story of the man getting stuck is quite believable, I’ve had a similar experience in Scotland, once you are in the forest of trunks you lose your direction very quickly. (I didn’t need rescuing though). I have also seen gorse in Oz & NZ and I know they are cursing us for taking it there in the first place; but it is hard not to enjoy it when swathes of gold cover the hills and the coconut scent is divine. On a positive note, you can make a very delicious wine from the flowers – although picking them is a but tricky! I grew up gorse deprived in Minnesota. I was a college student when I first saw the beautiful blooming gorse in the West Virginia mountains , I wanted to paint them, to make big bouquets of them and transplant them home to my gardens which I missed terribly. A Virginia friend was horrified and gave me long lectures on the terribleness of the plant, its invasiveness and why I must destroy the cuttings, rootings and all immediately. This gave me hope it might survive in Minnesota. I envisioned it as a yellow substitute for forsythia which also died off regularly in my garden. In spite of my best efforts Minnesota killed the gorse off anyway along with all the other plants I tried to grow. If anyone finds gorse in Minnesota- it wasn’t me! !